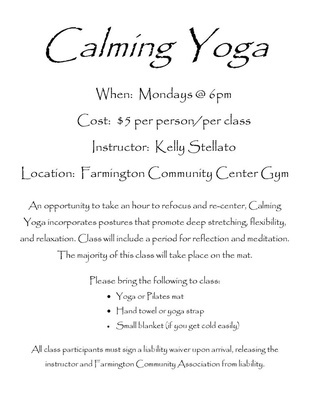 An opportunity to take an hour to refocus and re-center, Calming Yoga incorporates postures that promote deep stretching, flexibility, and relaxation. Class will include a period for reflection and meditation. The majority of this class will take place on the mat. All class participants must sign a liability waiver upon arrival, releasing the instructor and Farmington Community Association from liability.